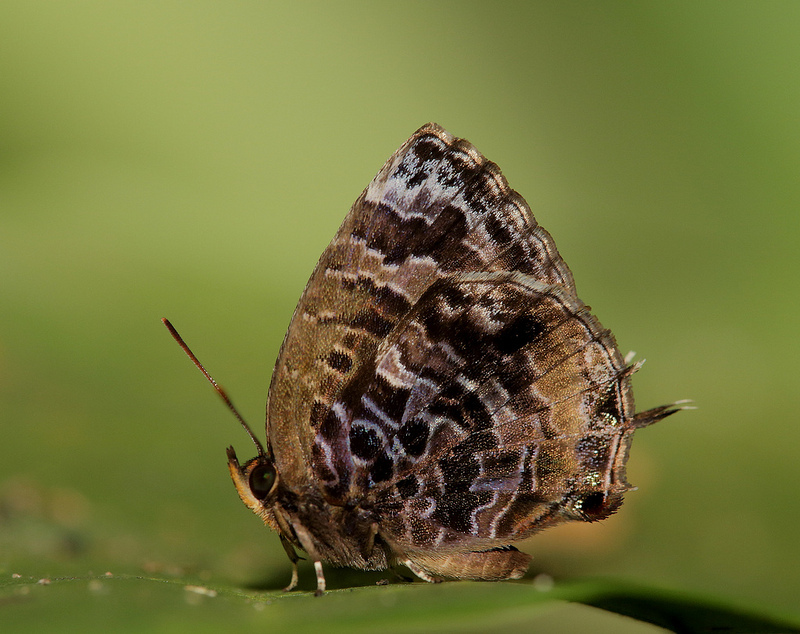 The diminutive Oakblue is one of many species in the genus Arhopala. The many lookalike species in the genus is a nightmare to identify and distinguish the different species. The Aberrant Oakblue is more distinctive in its markings, and is much easier to separate from the other species in the genus. It is a fast flyer and is usually skittish. It lurks in the shady forested understory in Singapore's nature reserves, but is quite widespread and is often observed in urban parks and gardens as well. This Aberrant Oakblue was photographed by ButterflyCircle member Koh Cher Hern. It was perched on a leaf in its usual pose, with its wings folded upright. The hindwing features three pairs of threadlike white-tipped tails of which the longest pair is at vein 2b of the hindwing. The brilliant purple blue upperside can sometimes be seen as the butterfly takes off when disturbed.